Be the digital logistics company of tomorrow. Today. The right technology helps your company sell more freight. We give you the power to sell more intelligently as well. We have developed a customisable Online Logistics Shop which you can easily integrate into your website and processes. From day one, you can provide your customers instant price quotation and an integrated checkout process. Currently, we have solutions for your Groupage, LTL and FTL shipments. Digitize and automate your sales. Transform the key processes of your sales operations, and provide your customers the most convenient logistics shopping experience. From registering to price quotation, we help you to provide your customers the fastest price offer in the market. Our comprehensive and intelligent algorithm automates your price calculation including all of your individual needs. So from now on, you offer your customers an instant pricing quotation with no waiting times. Your customers can directly decide whether to purchase the provided freight quotation, and order it through the integrated checkout process. With our online logistics shop, we digitised the complete purchase process. Forwarding order and shipment label are created immediately. In the end, all orders are transferred instantly via an electronic data interface (EDI) into your Transport Management System. Your data set is always updated in real-time. You can focus on the satisfaction of your customers. Today’s customers prefer an instant pricing and online shopping experience. With the Frachtklub online logistics shop you can meet this need. The Frachtklub algorithm takes over the spot price calculation. Thus, all your spot price requests get answered instantly never leaving a request unanswered. Automate the manual and repetitive spot price process enabling your employees to have more time for more satisfying tasks. FRACHTKLUB is a logistics and tech startup digitising logistics companies. We enable logistics companies to make their entire product portfolio online accessible. 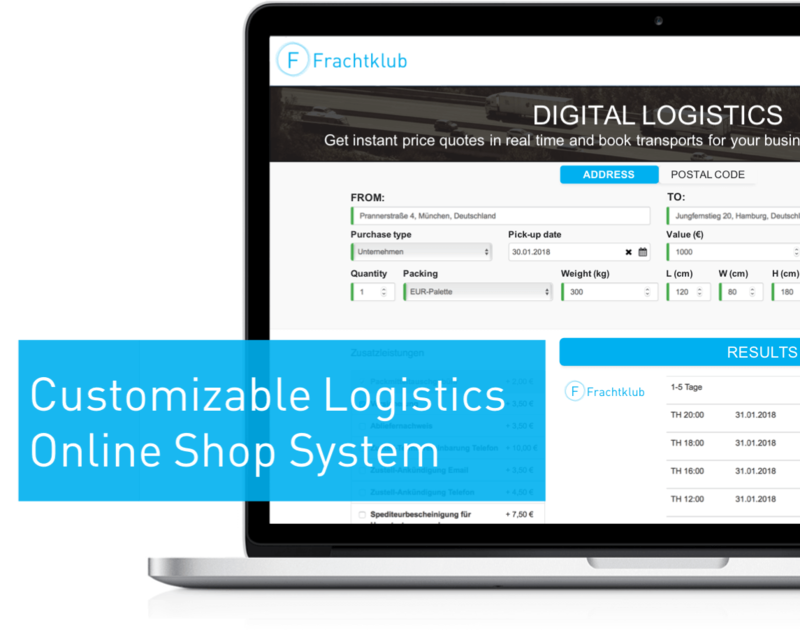 With the Frachtklub logistics shop, European logistics companies create digital competitive advantages, great logistics shopping experiences for their customers and automate their processes. Together, we set a new standard for smart, intuitive and digital logistics transactions!